Chuck Oliver of Oliver Brothers Productions brought in a full 5.1 surround system for the Star Wars Celebration, held in Anaheim, CA, April 16 to 19. No matter how long you’ve been working in AV, it’s still fun when the sound is so big it makes your shirt shake, and the video is so earth-shattering they have to play it again to keep the audience from rioting. Those conditions are just standard operating procedure for some technicians, particularly those that work in any proximity to Lucas Films and a little cinematic phenomenon known as Star Wars. Such is the case for Chuck Oliver of Oliver Brothers Productions (OBP), which may have a headquarters in Fort Worth, TX, but the actual Oliver Brothers travel to a galaxy far, far away at least once a year for the annual fan mecca Star Wars Celebration (known as SWC to insiders) event. Held this year at the Anaheim Convention Center April 16-19, SWC fully rocked its Lucas Film, Disney, and Dolby connections to blow the little hooded capes right off the furry heads of Ewoks. But the setup went far beyond standard wall-of-sound stuff, and it was definitely crazier than your usual cinema system. This was a full-on line array surround setup. A what? Yes, OBP designed two mega-surround setups. For the first of these, Oliver designed in five columns of SLS Audio compact line arrays from the PLS series, arranged in an LCR configuration behind the perforated cinema screen up front in the 2,500-seat theater, with two stacks in the rear. Six dual-18 SLS subs capped out the system, with three broken out in LCR fill, and the other three doubling the kick when the deepest low-end effects of the movie rattle the room. But that was just the regular ol’ movie theater. 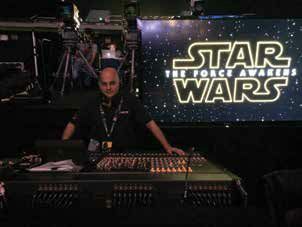 To make a gigantic sonic impression with the premiere trailer for the much-anticipated Star Wars feature, The Force Awakens, Oliver decided to go a little bit nuts with the 5.1 surround system in the 5,500-seat domed arena. There, he spec’d 16-element hangs of the SLS Audio LS8800 line arrays in an LCR configuration once again, but Lucas Film wanted to make sure the center channel was spread plenty wide, so he augmented it with two outfills of eight 8800 boxes per side. Rigging limitations kept the rear hangs to 12 elements per side of the SLS Audio LS6500 line arrays. Fears about the dome’s sonic signature were abated with some strategically hung thick velvet drape, and the result was really tight once the room was filled with Star Wars fans. Gotta love the enthusiasm of those fans, engineers, and sound crew members. In other big sound news, TC Group’s Applications Engineering and Training (AET) division in Austin, TX just added two new designers. Shawn Watts, recently of MUSIC Group and QSC, joined up, based from his office in Dallas, TX, and Simeon Ludwell, who left his post at Shen Milsom & Wilke’s Hong Kong office to take up the post of Senior Project Manager for AET. The new hires make a global footprint for AET, which also has two team members in Europe. The investment in applications support and training has certainly paid off for TC Group, which in April had its second-best month in TC history, with TC Group Americas currently having its best year ever. “Since the inception of AET, we have shown continued growth,” said Graham Hendry, who launched the AET division four years ago, and serves as its vice president. AET is all about continuing the TC mandate of maintaining autonomy between brands, but bringing them together when it makes sense, Hendry explained, pointing out that Lab.gruppen, Tannoy and Lake are the particular candidates used most often in commercial integration.